So your name speaks for itself? 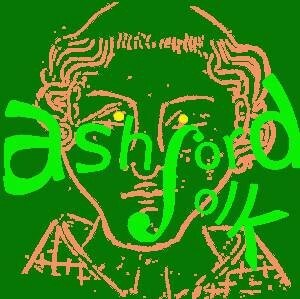 Yes, we’re called Ashford Folk, because we play folk in Ashford! There are 15 of us. Our instruments are Accordion, Bodhran, Fiddles, Glockenspiel, Guitars, Harmonica, Mandolin, but we’ve also had Flutes, Whistles, Melodeons and Banjo. We meet every Thursday, at Christchurch on Beaver Road. Anyone is welcome! We have had off shoots for the band to some of us went to Bad Munsterteifel to play in their Karneval in February. 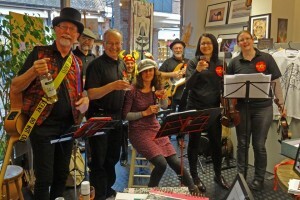 People might also want to engage us to play for them at family gatherings, barn dances or social events too. A few of us played gently at a wake recently, and we’ve played in Park Mall, County Square, The Bandstand, Evegate and the High Street. Do you have special yearly events? Who is the chairman/vice chairman? Piers Griffin is our chairman, but the most important member is the band leader Gemma Gayner. When was the club first formed and why? We had been playing for many years at Highworth Grammar School as the Gower House Band, but a year ago we had to move. We get so much pleasure from what we do, we didn’t want to let things drop, so we set ourselves up as this community band, open to everyone. We had a great deal of set-up help from Councillors Adby, Koowarree, Sims, Smyth, Wedgebury. That let us get over the shortage of start-up funds, and, thanks to them, that set us up well on the road. One thing is that we’re open to everyone, anyone who turns up. We don’t hold auditions, so no-one has to feel “I’m not good enough”. If some pieces are too difficult, people just sit tight and listen, and that’s alright. We’re special too, because we stick mainly to English traditional music. We love Celtic music, and many of us will travel miles to sit in with musicians from other traditions, but we wanted to keep English music alive and kicking. Some friends played Beatles songs at a concert last year, saying they were “retro”. They ain’t half as retro as us!! Hardly anything we play is later than the end of the 19th century! Why should people want to get involved with your group? We’re not flash, we’re not musical snobs, and we’re not purists. We’re helping to keep English music alive and live. We’re a mixed group of people musically and personally, who get on well. We hear hardly any English music in the media, but we know that people really like the “bounce” of English music. Last time we played in Park Mall for Betsy Aidinyantz at CCE, we had a bunch of Calaisiens jumping up and down to what we were playing. Have there been any significant changes at the club in recent years and what plans does the club have for the future? Apart from the change of name and membership and location, we’ve been doing this for at least 15 years now. Perhaps we should have called ourselves Trigger’s Broom! New tunes, new members and new arrangements always bring interest to what we do. We’re looking for a sponsor for our band’s sweat shirts and polo shirts if there’s anyone out there interested in some publicity!! Musically, we want to develop our sound, our arrangements, and our ease with the music, so that we can leave music notation behind and play without printed music. Are you looking for new members and if so how can they contact you? Can anyone join? We welcome new members, good or not so good, as instrumentalists or singers. We’d like some good singers too, we’re all OK to bawl our heads off in choruses, but we’re weak on “proper” singers. Our youngest member, Lily, is 9months old – she’s our leader Gemma’s daughter. Apart from her, our ages range from 30ish to late 60s, though some of the older ones behave in a very juvenile manner sometimes. We’ve got the web-site: Ashford Folk Music Resource, or ring Jim Davies (secretary) on 633085, or email him on daviesafk@gmail.com, but best of all, just turn up, buy us all a beer, and “listen to the music”, as the Doobie Brothers said!